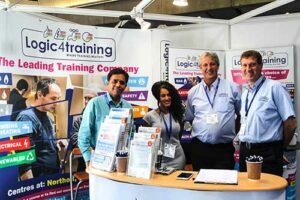 On the 20th and 21st of June 2018, Logic4training once again exhibited with a whole host of industry experts, manufacturers, engineers and journalists at PHEX Alexandra Palace 2018. The show was a great success and particularly busy on Thursday. 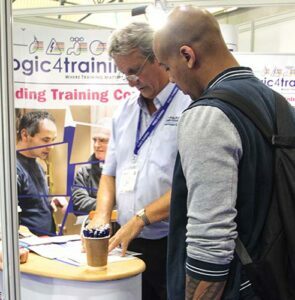 In Jim’s absence, Russell had to be the star of the show at stand 79, providing installers, young or old, with answers to their questions. We were also accompanied by our new member of staff, Harshal, who was happy to talk and jump into some conversation and provide information about our courses. There were many great conversations going around our stand about 18th edition, students looking into gas for the first time, and some where just past candidates coming to say hello. 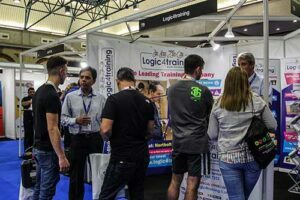 The PHEX Show created the usual flow on Social Media with posts of new technology and tools, highlights of the seminars, and fellow tradesmen and women meeting up and having a laugh together. A BIG thank you to the team behind PHEX and all their hard work and we can’t wait for the next one. See you all at the next exhibition!